Digital video continues to enjoy overall growth on desktop. Total videos and total minutes climbed at over 60% growth in the last year, indicating that users are taking advantage of the wealth of video content now available. 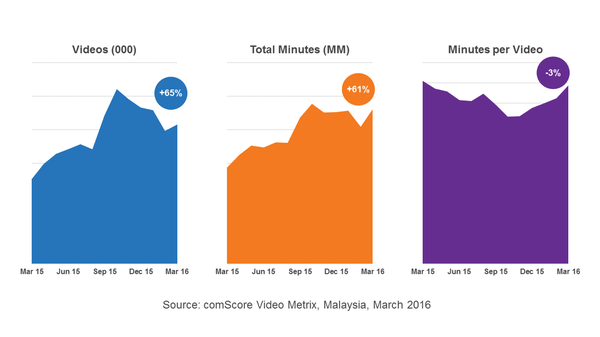 One metric that has remained relatively flat is the average minutes per video. Taking this into consideration against the overall growth of the other two measures suggests that much of the growth has been driven by shorter-form content, which most likely also includes advertising. In line with the average consumption of desktop content as a whole, it is the 18–24 demographic which views the greatest per person number of content videos in a month, around 30% more than the other demographics. At the same time, there is a spike in engagement for users aged 45–54, suggesting that video on desktop is a means of reaching them with content or supporting advertising messages. When we add advertising minutes per person onto the figures, we see that users aged 18–24 view the most ad videos in a month of all demographics, while those aged 45–54 view the least ad videos. 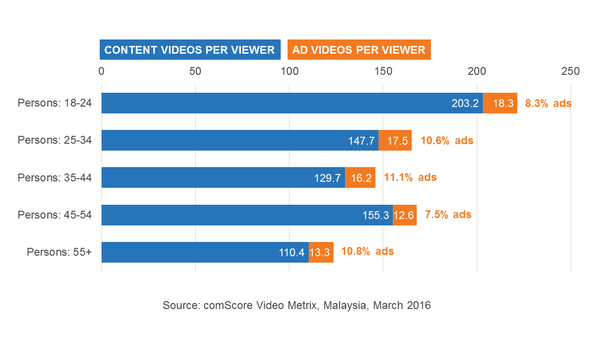 However, because of the larger number of overall videos, the percentage share of ads is not the highest for the 18–24 demographic. These figures suggest that advertisers can take advantage of disparities in saturation of ads to increase their share of particular audiences reached with their messaging. Video categories experience significant demographic variation, which can be used for either recruitment for publishers or targeting for advertisers. In the example below, we contrast the Lifestyles category against the News/Information category for basic age demographics. 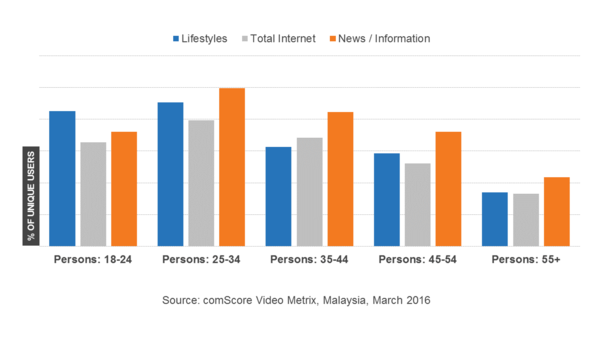 Lifestyles content offers a heavier share of younger, particularly 18–24, users, whereas the News/Information category is more evenly distributed and peaks for the demographics between 25 and 44. If we factored in other demographics such as gender, the example would look different again. 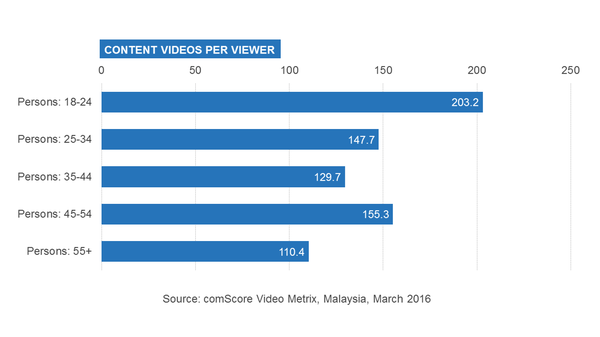 For more information about Video Metrix, please visit: www.comscore.com/VideoMetrix. For more insights into the Malaysia online audience, download the full presentation Understanding Malaysia’s Online Audience in 2016 here.